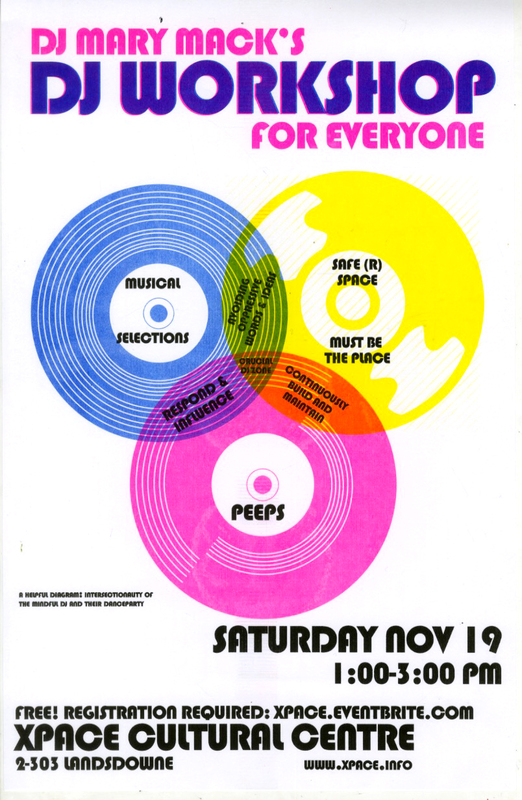 An inclusive workshop to demystify DJing for anyone who wants to learn, with a priority for those underrepresented as DJ’s – women, trans, queers, racialized and Indigenous folks. All are welcome! We will focus on core skills of a good DJ – musical taste and transitions. We will go over the technology basics of DJing with turntables and a mixer (for vinyl!) as well as newer technologies which allow you to cue and manipulate digital tracks. No equipment is needed, but bring some MP3 tracks on a USB key, or a few records to play if you like. With 20 years of experience as a disc jockey, DJ Mary Mack learned how to DJ at WRCT Pittsburgh, Carnegie Mellon’s free format radio station, where she held a weekly show (with some pauses) for almost 15 years. She moved into organizing and DJing live parties as a way to contribute to grassroots movements and community projects that advocate for equity and social justice. From 2006-2012 she co-organized Operation Sappho, a monthly queer/dyke danceparty, creating TQZ’s (“temporary queer zones”) and striving to build safe(r) spaces in all venues. She currently co-presents Hey QT with DJ’s Sigourney Beaver and Joe Blow, and DJ’s all around Toronto in spaces such as the Holy Oak, the Gladstone, and Buddies in Bad Times Theatre.